It’s been quite a while since I have participated in a Spartan Sprint. Activity was much increased since the last time. Great signals on 40 meters. It was really a thrill to have a coast to coast QRP QSO with W7OM in Washington. I could only participate for the first hour. I had a total of 10 states using my K3 at 5 watts. Signals seemed very weak into Florida tonight on 20 meters so gave up and moved down ‘open up’ 40m. Sure enough, it wasn’t long until some S-Sprinters started showing up. You know how we frequently get calls from non-participating stations? Well, maybe we’ll get a new one. Fellow with a good fist in Tampa likes QRP so we’ll see. Big signal tonight was John K4BAI, but then John always has a strong signal – even when I work him from PA. Tnx for the fun. moved to 40m. Thanks for the Qs. K3 (5w), doublet and vertical, GenLog. Fun time again with the K1 and LG-Nok-sung battery. Lots of Qs on 20 and half as many on 40. Worked coast to coast on 20 and not quite so far on 40. I called N1IX, Barry, sorry Dave. K4BAI, you are a stalwart on the bands. Every time I turn on the rig, there you are John. I'm convinced, if you needed a back-country emergency comms link, you would do well with a CW HF rig setup and put out a call for John, he'll respond! A good evening here in Idaho. More folks on again compared to a few months ago. 30 Qs in first hour then it slowed down to 14 more in the second hour. We don't count SPCs, but I like to keep track of them. This time there were 14 states and 1 province. I got 2 bands, 20 and 40, with 11 stations plus WB5BKL and I got 3 bands, 80, 40, and 20. He was the only one I could get on 80 in the last 20 minutes. Sunset isn't until 0225 or so. A special thanks to W4ZV who stayed with me as I repeatedly botched his call. Sometimes when you get a few letters wrong, it takes several repeats before you get it correct. That was one of those. Catch you all next month. 20 meters was good this evening; Looking forward to next month. Thanks to you all for the great time I had tonight. I ran the entire two hours at 1 watt from my K2. I had 5 two bangers, WA8ZBT, NQ2W, N3VKM, N1IX, and K7TQ. I almost had a three banger but NQ2W just couldn't pull me out on 80 at the very end. I spent most of the time calling CQ with maybe 20 minutes or so of H&P. I did hear several other good signals but they were calling another station and never found me. I had 11 qso's on 20, 11 on 40, and just 1, K4BAI on 80. I surely appreciate each of you for hanging in there with me and my 1 watt. Ah, the power of QRP . . . this is just too much fun. Equipment: ICOM IC-7200, 5W, AH2 Auto Tuner, 920 Foot long wire. Haven't played in the Sprint since November 2014. Before that, it had been a long time. This is my first score posted in over a decade. Still as much fun as back then!I made 22 contacts in-between taking care of 5 young kids needs and other honey-dues. Still managed to work VE3AXL, Ontario Canada, WA8ZBT and WB5BKL in Texas, all on 40 meters! (Thanks for hanging in there with me guys!) Total different states worked was 11 on 20 meters and 5 on 40 meters and one Canadian Province. What a blast! Hope to catch you all on next month . . . as long as I don't miss my android calendar reminder! Good conditions on 20, 40, and 80. Good participation at the start, then dropping off. QSOs by band: 20: 23. 40: 22. 80: 3. 20M was good for most of the USA out past maybe 800 miles. Did have a backscatter QSO with W4ZV in NC. Also best DX of the night was UA9CIC running 8W from the western part of Asiatic Russia. 40M was pretty good all over with no discernible skip zone. 80M was quiet and was able to work out to NQ2W (a 3 bander) and WB5BKL (another three bander). Did hear K7TQ, but Randy couldn't hear me calling on 80M. See you all next month. Also, in the Georgia QSO Party this weekend. K1 at 5 W to a 2-element mini-beam at 25 ft for 10, 15, and 20 meters, an inverted V at 40 ft for 40 m, and near bottom-loaded, ground mounted vertical for 80 m. 11 QSOs on 20, 10 on 40, and 2 on 80. A number of 2 banders between 20 and 40. Worked K4BAI on 3 bands. There was one station trying on 80 but I couldn't hear through the QRN . . . hopefully, next time.Thanks for the opportunity. Hope to hear you all next month. Fired up my old ATS-3 for a few QSOs on 20m only. It seemed like activity was low which could have been due to the NCAA playoff. Some signals were quite good but a few could not hear my 3 Watts to an inverted V. Congrats to John, K4BAI, who has outstanding ears to hear my signal via backscatter. The most interesting thing was when I checked my RBN spots later. I was shocked to see 41 spots from stations in EU (DL, F, GW, HA, I and ON . . . not counting KP3 and VE6!). Maybe we should encourage EU activity (even though it's the middle of the night there). I QRT after about 1 hour to catch the last half of the playoffs and see Duke win (YEA!). After finding nothing on 10m, 15m and 20m, I finally arrived late on 40m and found these 2 stations to work before the end of the Sprint. TNX to N7LT in MT and K7TQ in ID. K3/10 @ 5W to 15 and 20M delta loops, a 40M dipole or a 40M extended double Zepp. 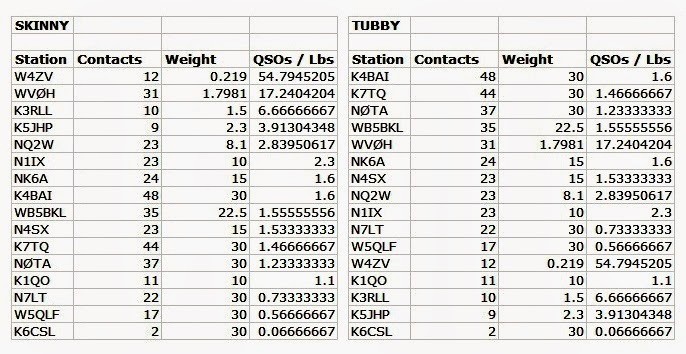 QSOs on 15, 20 40 and 80M - 15 states total. One QRO QSO not counted. 15 seemed wide open but I ran out of QSOs after 0115Z. Best signals here in the Texas hill country: 15 and 20M - NK6A, 40M - AA5D, 80M - WA8ZBT. Most remarkable signal: N4SX @ 1W. Nice to work several new-to-me calls. My thanks to all. Had fun.